(SRS) AIR BAG” and SEAT BELT PRE-TENSIONER” 7, precautions for On Board Diagnostic (OBD) System, oN BOARD DIAGNOSTIC (OBD) SYSTEM 39, oBD-II Function A/T System 39. One or Two Trip Detection Logic OBD-II 39, oBD-II Diagnostic Trouble Code (DTC) 39, how To Perform Trouble Diagnosis Quick, check Before Engine Is Started 56. Cruise Test - Part 1 61, cruise Test - Part 2 64, cruise Test - Part 3 65, vehicle Speed at When Gears Shifting Occurs 66. 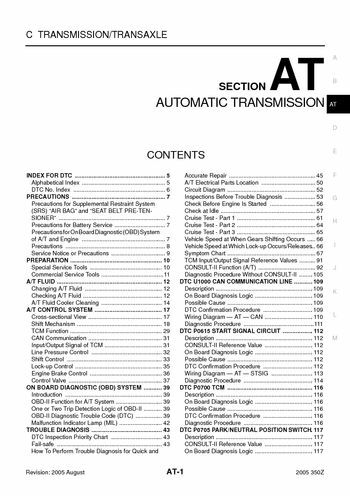 Vehicle Speed at Which Lock-up Occurs/Releases 66, tCM Input/Output Signal Reference Values 91, dTC CAN COMMUNICATION LINE 109, wiring Diagram — AT — CAN 110. DTC START SIGNAL CIRCUIT 112, wiring Diagram — AT — STSIG 113, wiring Diagram — AT — PNP/SW 118, dTC VEHICLE SPEED SENSOR A/T (REVOLUTION SENSOR) 121. Wiring Diagram — AT — VSSA/T 123, dTC ENGINE SPEED SIGNAL 126, dTC LINE PRESSURE SOLENOID VALVE, dTC THROTTLE POSITION SENSOR 136. DTC A/T FLUID TEMPERATURE SENSOR, wiring Diagram — AT — FTS 140, dTC TURBINE REVOLUTION SENSOR 144, dTC VEHICLE SPEED SENSOR MTR 146. DTC A/T 1ST ENGINE BRAKING 151, dTC INPUT CLUTCH SOLENOID VALVE, dTC FRONT BRAKE SOLENOID VALVE 157, dTC FRONT BRAKE SOLENOID VALVE. DTC DIRECT CLUTCH SOLENOID VALVE 161, dTC DIRECT CLUTCH SOLENOID VALVE, dTC HIGH AND LOW REVERSE CLUTCH, dTC LOW COAST BRAKE SOLENOID. DTC MANUAL MODE SWITCH 173, cONSULT-II Reference Value Data Monitor Mode, wiring Diagram — AT — MMSW 174, dTC ATF PRESSURE SWITCH 1 178. DTC ATF PRESSURE SWITCH 3 180, dTC ATF PRESSURE SWITCH 5 182, dTC ATF PRESSURE SWITCH 6 184, mAIN POWER SUPPLY AND GROUND CIRCUIT. Wiring Diagram — AT — MAIN 186, cLOSED THROTTLE POSITION AND WIDE OPEN, wiring Diagram — AT — NONDTC 193, a/T Check Indicator Lamp Does Not Come On 196. Engine Cannot Be Started in P” N” Position, in P” Position, Vehicle Moves When Pushed 197, in N” Position, Vehicle Moves 198, large Shock (N” D” Position) 199. Vehicle Does Not Creep Backward R” Position, vehicle Does Not Creep Forward D” Position, vehicle Cannot Be Started From D1 207.